I guess because I have never attempted a sculpture in metal, I am fascinated by what sculptors can create. I wanted to feature one sculptor that I just learned about and another who lives in my areas whose work I have enjoyed for years. I learned about Stephen Canneto's when he was recently featured by ArtsyShark. I definitely found exploring his website very worth while. He has created a variety of figurative and abstract sculptures, many are public art. The grace and fluidity of Stephan's work is amazing. Some of his pieces include glass balls and panels. Ed Kidera has a studio here in Maryland. His work is ahead of its time, working for many years with recycled parts including old steel cylinders, car, truck and farm parts. He creates unique pieces for home, garden, and public art. 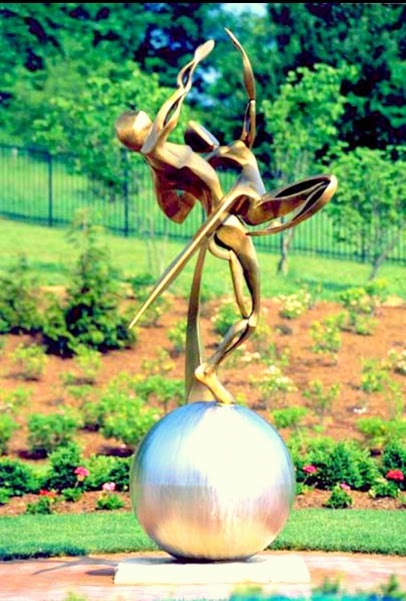 His sculptures have been part of several Howard County's ARTsites, including "Getting The Band Back Together" from 2013. Most recently Ed Kidera was commissioned to create several sculptures for the new entrance to the Columbia Mall. 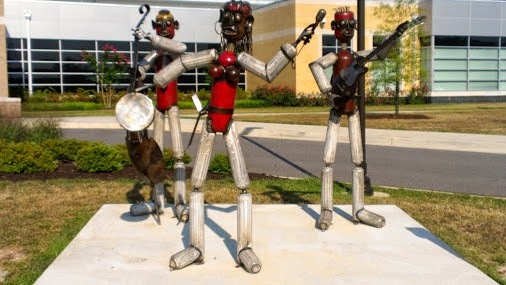 "Getting The Band Back Together" is one of the sculptures included in the Columbia Mall project. Watch Ed's video of the installed sculptures and be sure to see them in person at the Columbia Mall, 10300 Little Patuxent Parkway, Columbia. The Grand Opening of this new entrance is scheduled for October 16, 2014. 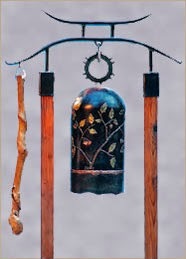 In addition to these public art pieces Ed sculpts the most melodious bells. About his art, Ed describes it as "functional art that lasts forever." Some of Ed's pieces can be used as sound systems for iPods, iPhones, and MP3 players. His creativity is boundless. Take a look at his variety of work on his website and in Ed's Etsy store. 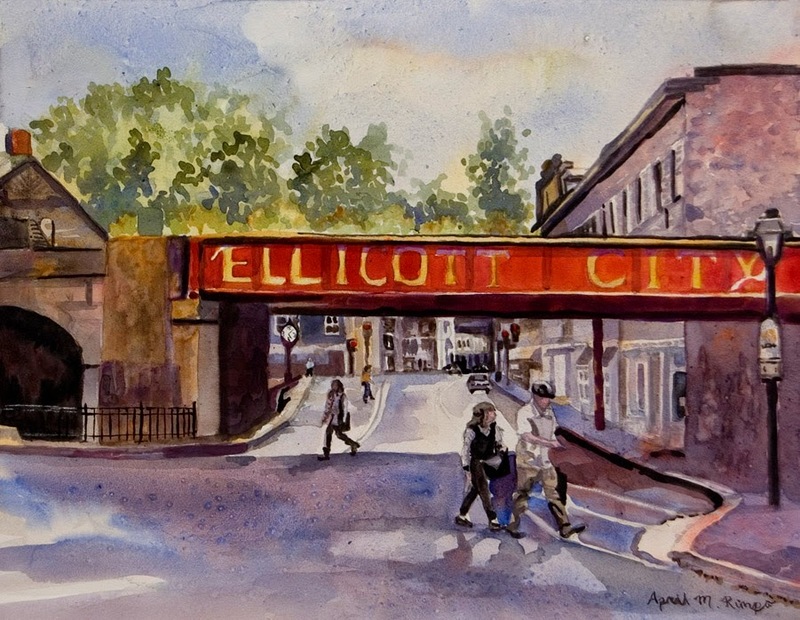 Ellicott City is a charming town not far from where I live. It is full of art and antique shops that draw people from far and wide. It is a favorite place for artists to paint. In fact, each year Ellicott City holds a paint out that brings artists to town to spend a weekend painting. The result is an exhibition, held in one of the Howard Country Arts Council's Galleries. There are so many paintings they often spill out into the hallways. 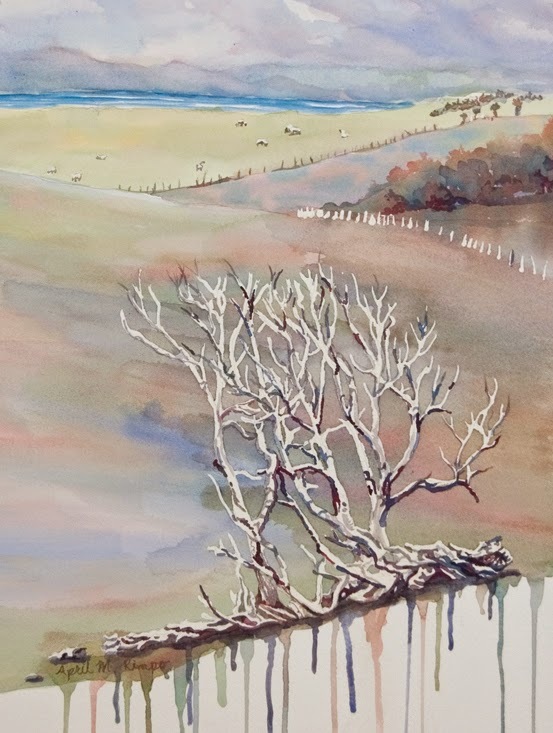 I have never taken part is this paint out, but recently decided that, since I paint places from across the United States, Provence France, and Guatemala, why not share a bit of home as well. Welcome Since 1772 is, I expect, the first of several paintings of Ellicott City. The title derives from the little ribbons painted in the upper left and lower right of the Ellicott City sign, that decorates the old train bridge you pass under on the way into town. One ribbon says, "Welcome", while the other proclaims the heritage of the town "Since 1772." 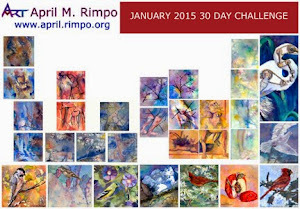 This painting is done using fluid acrylic on a deep cradle Aquabord™, a trademark of Ampersand. Ampersand describes Aquabord™ as "an acid-free textured clay surface that absorbs watercolor like a fine paper." 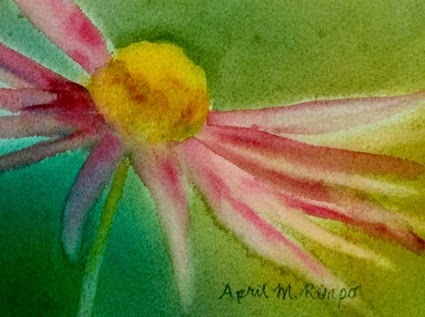 I used a version of Aquabord™ that has a 2" deep cradle that eliminates the need for framing. I varnished the finished piece to protect it from dirt, moisture, and discoloration. I'd love to hear your thoughts on this painting and I'd be happy to answer questions about my experience using fluid acrylic and watercolor on this painting surface. 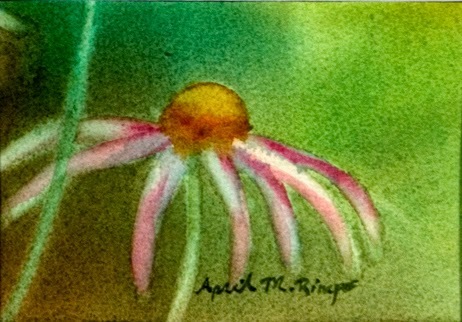 Recently I was going back through old discarded paintings and realized that although I had inserted an ugly, poorly painted moth into the center of a painting of daisies, the balance of the painting was nicely done. There are nice transitions from light to dark in the background, interesting color blends, and I had done a good job of lifting out the background to add the soft pink petals. Not something worthy of an award, but something that deserved saving. Many times when I do this I conclude repainting is the only solution. Occasionally I think I can work on the painting some more and give it new life. In this case, I decided to crop the painting into several smaller paintings and washed out fragments of the moth that remained toward the edges. 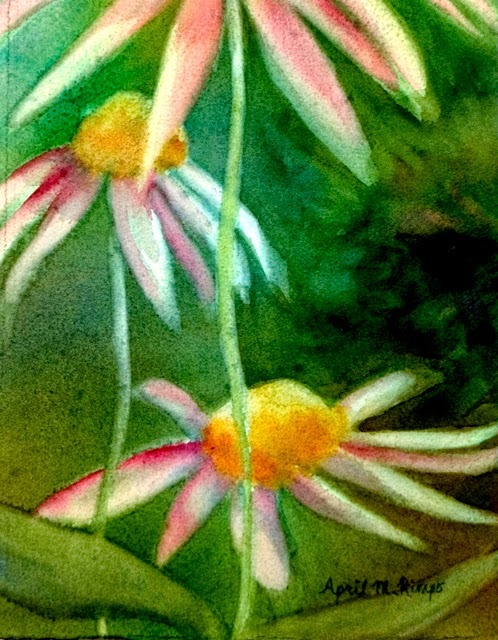 Then I added back in some dark colors to form interesting background shapes and strengthened the contrast between the flowers and background in other areas. Don't ask me what I was thinking when I added the moth. 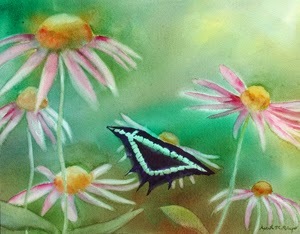 Actually, I may have done this painting after visiting a Garden that had a Butterfly Museum. I believe I decided the painting should pull from the gardens and the museum. NOT a good decision, at least not how I executed the moth. It looks stuck on and misshapen. So here is what I have done now. I traveled with my family to New Zealand about ten years ago. We traveled all over both the North and South Islands. Everywhere we went was beautiful. What amazed us what how these two little islands had nearly every ecosystem on the planet: volcanoes, glaciers, marshes, rain forests, and more. One area we visited along the northwest coast of North Island had beautiful beaches with black sand, caused by the volcanic area further inland. This area is dotted with farms but in some spots the winds are so hard and constant that the trees grow bending toward the east. Some, like those shown in Monuments, lose all their leaves, but many remain standing, like they won't let the wind win. I thought these wind and sand bleached trunks were beautiful additions to the landscape that deserved to be featured. This image shows the front of a gallery wrapped painting done on watercolor paper and then varnished after it was wrapped. The painting extends around the sides of the frame allowing the painting to be hung without a frame. I use a satin finish varnish to avoid glare on the surface.